Want a Vinyl Fence? Call Hercules Fence, your Manassas Fencing Company! 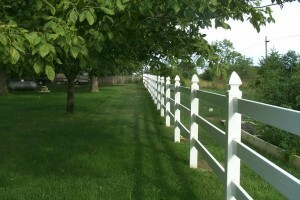 Hercules Fence of Manassas is the largest fence company based in Northern Virginia. What does this mean for you? We cannot only get you the vinyl fence you want, but we can get it at a price you will love, a price that complements our quality. Please take a moment to browse our many other residential fence options, including Custom Wood, Ornamental Steel Fences, Chain Link Fences, and Ornamental Aluminum Fences. If you want a great looking fence, but don’t want the annual maintenance you get with wood, than a vinyl fence is what you need. Vinyl has soared in popularity since its inception, offering homeowners a, attractive, durable, cost-effective, and low maintenance alternative to wood. Durability: Vinyl will never rust, decompose, or splinter, meaning it tends to last longer than wood. Oh yea, and Vinyl fences are also close to five times stronger than wood. And because vinyl is flexible, it will not easily break in high winds. Low Maintenance: A vinyl fence is a great, low-maintenance option for your Manassas home. Vinyl never requires painting or staining to maintain its visual appeal. And when it comes to cleaning, all you typically need is a garden hose, soap and water. A power washer can often be used for tougher cleaning jobs. Won’t Fade: UV inhibitors are added to help maintain an attractive appearance for many years. Affordable: Best of all, vinyl fences are very affordable, especially true when you consider how much you save in maintenance over your fence’s lifetime. Since 1955, Hercules Fence has been providing professional service and quality vinyl fence installation for both commercial and residential fences in Manassas, Virginia. We pride ourselves in installing high quality fences at affordable prices. If you have any questions about a Vinyl Fence for your Manassas Home, please contact Hercules Fence of Northern Virginia today by calling (703) 551-2609 or visiting our website. Also, check out Hercules Fence of Manassas on Facebook, Twitter, Google+ and YouTube! This entry was posted on Thursday, March 27th, 2014 at 2:57 pm. Both comments and pings are currently closed.